THE MARY BUFFET: Samedi, a Trip to Bayeux. We left Paris Saturday morning. Chris picked up our car rental and returned to the apartment to load us up. We were worried a tiny car would be forced upon us, but our travel agent, Chris, secured us an Audi station wagon. We entered our destination, Bayeux, into the navigation system, and were on our way. We traveled the first approximately 200km of the trip on the A13 where the traffic was fluid but toll stations abound. We paid a total of 21,50 euros at 5 toll booths before taking the exit for Dives sur Mer to look for lunch. There, we came across Le Bougnat which looked to be quite busy, as is always a good sign. It was the quintessential French restaurant, with great atmosphere and good service. I had the 72 hour braised beef with mashed potatoes. Pretty good. Chris had a seafood bisque which was excellent, but the ham from his plat was just okay. 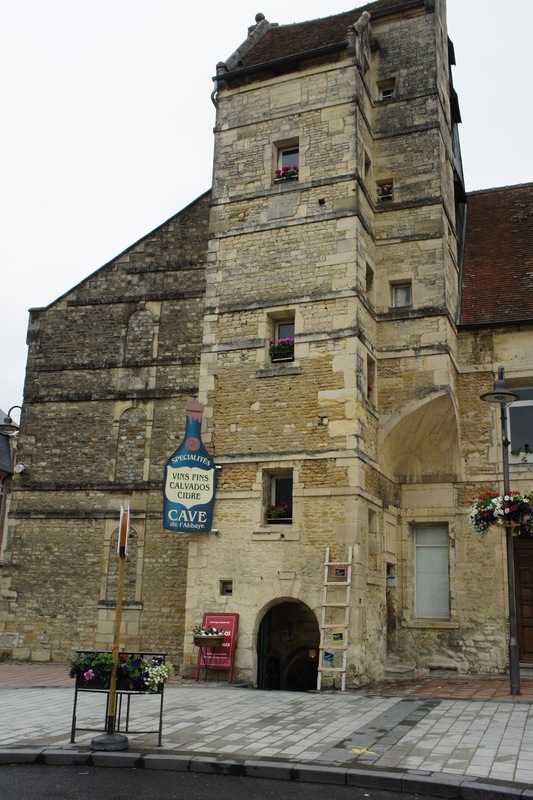 We took a short walk around town and came upon a wine shop, Cave de l'Abbaye where we picked up a bottle of Calvados produced in the Pays d'Auge area which is known for its calvados. Salted caramels must also be a specialty of the Normandie region as there were plenty of those around as well. With both in hand, we were on our way. For the remainder of the drive, we decided to take smaller roads to get a feel for the countryside. What a beautiful drive it was. The route we took ran along the coast. There were miles upon miles of wheat fields, along with potato fields and other various vegetables. But the wheat fields were massive. There were white cows grazing the fields from time to time. The air was so fresh and smelled of the fields and the light ocean air. Fabulous! 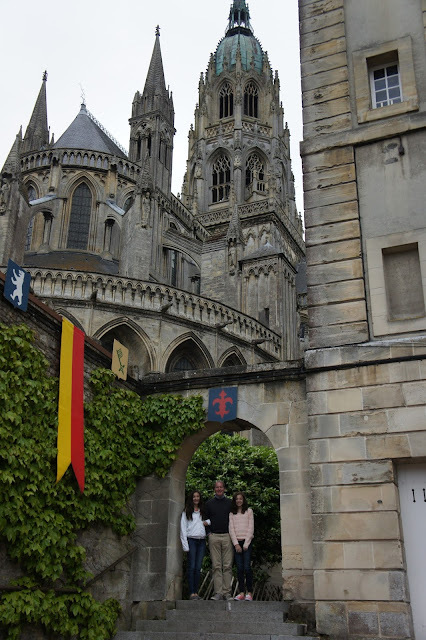 We arrived in Bayeux about 5:30pm and checked into our hotel, Hôtel Reine Mathilde. Chris came through again with a great pick. Centrally located, fairly roomy with an extra large bathroom, we were thrilled we could fit all of us and our luggage comfortably into the room. We settled in, rested for a bit and then went out to find dinner and explore the town a bit. Our initial thought was to just go to the hotel's restaurant. Since we didn't have a particular preference for anywhere else in town, we thought we'd support the hotel. Well, once we got walking, we came across Pizza Fred'Au, whose smells lured us in. It is a small pizzeria, but they were also doing a good take out business. With just one person in the kitchen and one person working the dining room, they somehow got it all done. We had really good pizza with excellent crust and the best ice cream we have ever had. The caramel ice cream had bits of caramel in it, the chocolate was dark chocolate with cocoa nibs and the strawberry had bits of strawberries and tasted like real strawberry. And I can only assume that the ice cream was made from the milk of those beautiful cows in Normandie. As we walked around town, we noticed an abundance of pizzerias and we saw several on our drive to Bayeux. We wondered by. After dinner, it was already 10:00pm and still light out, but we were headed back to the hotel for reading, a movie perhaps, blogging, or bed. A final word is praise for Chris for all of time he spent researching our trip. We are the benefactors of his hours or hard work not forgetting the pressure of having to please three ladies. Today's drive and Bayeux has been our favorite of the trip so far. Pizza, ice cream and a medieval village equals happiness. Our room is the last window you see on the right. It backs up to this stream on one side.